So, I haven't been stitching that much lately. I have big plans to stitch, but I get lured by my knitting projects. I like to work on something until it is finished. Much how I am with reading.... I rarely have several books going at once. I like to read.read.read until I am finished. So, that is how I approach projects. Knitting takes me much, much longer than stitching and my 2nd scarf felt like it was never going to be complete. 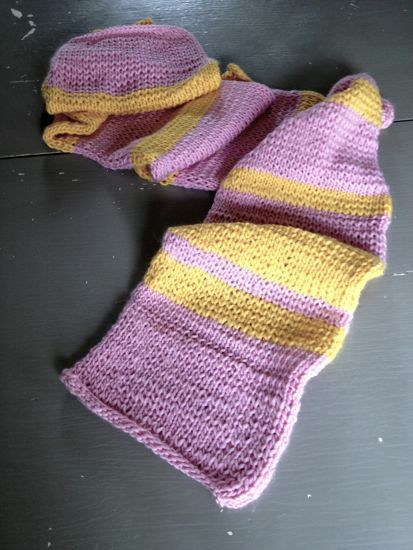 I wanted something striped and I changed between the peony pink and the golden yellow several times. I have started on my 3rd and am about halfway through it. Seriously, everyone is getting a scarf for Christmas this year!